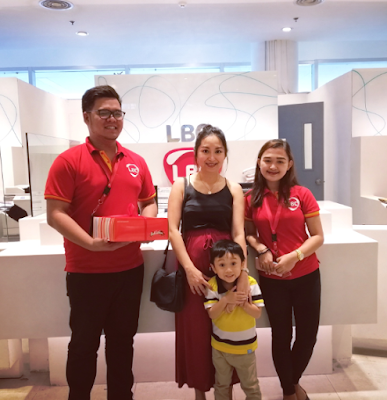 For many decades, LBC has provided service that goes above and beyond the norm to help customers.This is why it stands happy and proud behind the Aming Ligaya campaign, where LBC facilitates a more personal encounter between their exemplary LBC agents and customers they have served well. A few months ago, LBC customer Ms. Roehlyn Del Rosario called the LBC hotline to follow up the delivery of her shipment containing clothes and cookies. After a few calls, Ms. Del Rosariospoke with LBC agent Jeca Poquita and TL Baylon Ausan and anxiously informed them that her consignee was scheduled to leave for abroad the next day and requested for the immediate delivery of her shipment. Agent Jeca and TL Baylon assured Ms. Del Rosario that her shipment would be delivered that same day and started to coordinate with other LBC employees to facilitate and monitor the delivery of Ms. Del Rosario’s shipment until it was successfully handed over to her consignee on that same day. On January 15, 2019, at the LBC Landmark Alabang Branch, Ms. Roehlyn Del Rosario was ableto personally meet Agent Jeca and TL Baylon via Aming Ligaya. it was evident that Ms. Del Rosario was eager to meet the two LBC employees since she chose to meet up with them even though she just recently gave birth. Ms. Del Rosario was smiling as she spoke with agent Jecaand TL Baylon and thanked them for their assistance. She even apologized to agent Jeca for her frantic demeanor during her follow up calls and explained that her anxiety about her shipment got the best of her at the time. At the end of their meet, Ms. Del Rosario expressed her gratitude by saying that the service she received from agent Jeca and TL Baylon was extra-ordinary and their actions have given her the confidence and trust to continue using LBC for her future transactions. LBC Agent Jeca and TL Baylon were visibly happy and delighted as they met and interacted with Ms. Del Rosario. Jeca said that it was nice to speak with a customer face to face and feel her sincere appreciation. Agent Jeca also mentioned that meeting Ms. Del Rosario made her realize how being sincere and dedicated to her job genuinely helped people. Aming Ligaya campaign is LBC’s way of shining the spotlight on LBC customers especially its exemplary employees and how essential it is to set a venue for them to interact after aservice has been well fulfilled. Moreover, through the campaign, LBC hopes to drive the message how much they value their people- and how committed they are in serving their customers the best way possible.